Belmont Roofing is proud to have been awarded the NFRC GOLD SAFETY AWARD and is a member of several safety groups. To ensure all work is carried out in compliance with current Health and Safety regulations Belmont Roofing employ an in-house Safety Officer who oversees our operations on a day to day basis, as well as a Safety Advisor who carries out random site visits and record all site activities. 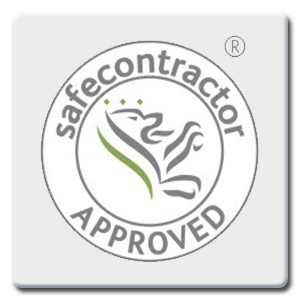 The Company remains in the forefront of the roofing industry and are recognised for their commitment in promoting a safe working environment and a Health & Safety culture throughout the Company. In an industry which is particularly exposed to hazards by working at height and often with naked flames or hot bitumen, Belmont Roofing takes its’ responsibilities very seriously and will not compromise its’ high standards for commercial gain. All our staff hold CSCS cards relevant to their position within the company and all plant operators hold CPCS or IPAF cards. 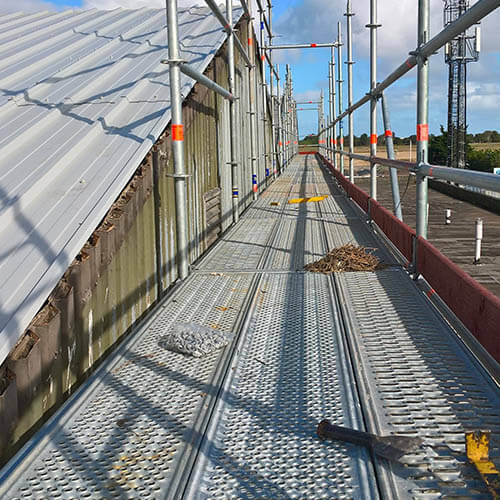 An independant gable scaffolding complete with a non-slip walkway not only complies with HSE recommendations but is safer than using cheaper edge protection as the old fragile roof becomes the walkway. The Work at Height Regulations 2005 (WAHR) came into force on 6th April 2005. Carried out in a manner which is, so far as is reasonably practicable, safe. By employing a “professional” company surely they have total responsibility and I cannot be held liable if there is an accident or avoid a prosecution under a breach of safety regulations? Answer: No! The Regulations place duties on principal contractors, clients, managing agents, contractors and factory owners alike. Why have you allowed for a full independent scaffold and access staircase? Others have costed for a handrail and tower access? Answer: It is good practice and follows HSE Guideline “r” which states “SAFETY MEASURES – it is vital that a safe means of access and egress is established for the roof work. 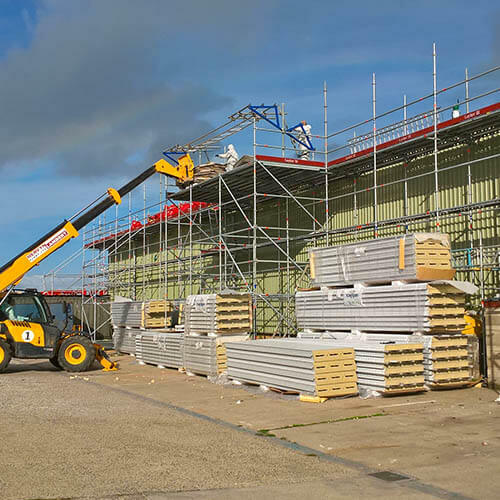 The most effective means of providing a safe working environment and ease of working around a fragile roof is a fully boarded perimeter scaffold positioned no more than 300mm below eaves level that includes additional lifts at gable ends. The preferred method of access and egress to and from the scaffold platform is via a purpose-fitted staircase”. A mechanical hoist to help minimise manual handling. Safety netting will generally be included in our quotations unless this is impractical i.e. if the area below is inaccessible, such as clean rooms. Also, nets will not be suitable if there is insufficient clearance height inside the building because of racking, plant and machinery. In these cases we can use specialist staging systems with edge protection that our operatives can harness onto. Safety Netting must be regarded as a secondary protection and the joint responsibility must be to minimise the risk of falls. Rescue Plan. 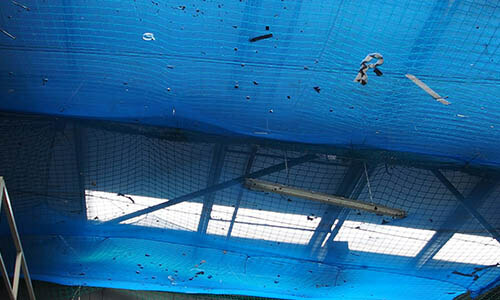 Under the Working at Height regulations there must also be a method of retrieval from the safety netting on site for the duration of the works. Surely these safety methods do not apply to cheaper options such as over-roofing or coating? Answer: Whether you are replacing, overlaying or coating, every option involves trafficking the fragile roof so the same level of protection will be required. There will be no cost saving on Health & Safety. We have covered some of the questions we are asked on a regular basis. If you have other questions just ask! Why is there such a price difference in your scaffolding and protection costs? 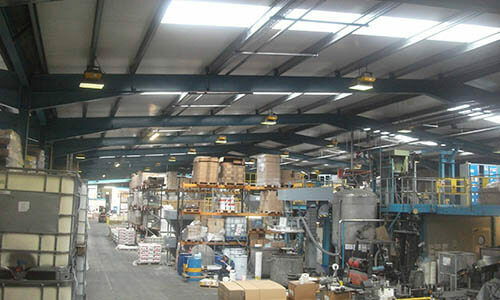 Answer: As an occupier and/or owner of premises you need to be satisfied that roofing contractors engaged on work to your premises have allowed sufficient resources (in time, money and expertise) to comply with your legal duties which are contained in Regulations 10, 14 and 16 of the Construction (Design and Management) Regulations 2007 and section 3 of the Health & safety at Work Act 1974. We have not stayed in business for 60 years by being expensive and uncompetitive. You should always check exactly what Health & Safety measures are being offered as there can be significant price differences between quotations if someone is cutting corners. If it looks too good to be true it probably is! We are worried about the health and safety of our staff if you are removing asbestos over an occupied factory or workplace. Are we right to be concerned and will we have to move out? Answer: We share your concerns and can show you projects where we have carried out stripping and roof replacement over occupied and busy factories. The roof is replaced progressively and although nobody can work directly below where the roof is being replaced, by careful management and close co-operation you should not have to move out. 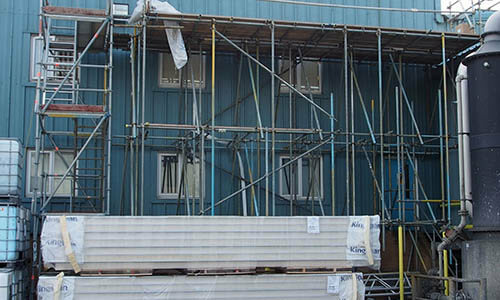 If you cannot temporarily relocate your workforce from under working areas we will provide internal ‘birdcage’ scaffolding to ensure you can keep working safely. We also arrange for air monitoring during the project to ensure that the work is within permissible levels to give you and your workforce reassurance and peace of mind. The results will form part of our H & S Plan which will be handed over on completion. For additional peace of mind our internal Health & Safety manager will be pleased to talk with you and your staff prior to any work being undertaken. Do we need to move out whilst the work is carried out? Answer: No. by careful management and close co-operation this will not be necessary. Nobody can work directly below where the roof is being replaced but this would be sectional and difficult areas may be carried out at weekends. Safety netting and additional debris netting will catch falling debris but in extreme cases, we can erect internal “bird-cage” scaffolding.